I’ve dived a lot around South East Asia over the last five years, and I’ve often been surprised at how cheap the diving can be here. If, like me, you like to dive often and travel specifically for the chance to dive, then there are plenty of opportunities to do so without having to spend a huge amount of cash. Indeed, with the cheap flights provided by AirAsia and other budget carriers in Asia, it’s possible to dive in several countries within the space of a few weeks and still not break the bank. (Search on Skyscanner to compare AirAsia flights with other airlines). As such, I thought I would start a list here on Divehappy of cheap places to dive in South East Asia. The list below is by no means definitive and I welcome suggestions in the comments of other places to add to it. I have stuck with places and dive operators that I have personally visited and dived with. The benchmark I’ve used is the cost of a one or two fun dives (ie assuming you’re already certified to dive) including all scuba gear. Virtually all operators offer package deals which make dives cheaper, so this is just a rough benchmark to help comparisons. Koh Tao is the most popular place to get certified as a diver in Asia Pacific outside of Cairns and it’s a renown backpacker destination. Located on the West Coast, Koh Lanta is Koh Phi Phi’s sleepy neighbour and much more relaxed as a result. Lanta has access to some of Thailand’s best dive sites – Koh Haa, Hin Daeng/Hin Muang and Koh Bida. Price: 2 dives are twice the price of Koh Tao – 3700 Baht or $110 US approx – because the dive sites are much further away – and you get breakfast and lunch included. The diving here is pretty amazing because the sites are so remote. You can also do liveaboards from Koh Lanta that can help you save on accommodation and food costs. See my article on diving Koh Lanta. The Similan Islands are widely regarded as Thailand’s best dive spot and are extremely popular. You can do day trips by speedboat but the best way to see them is on a liveaboard. I also wrote up a detailed Similan Liveaboard report if you want more of an idea of what a liveaboard trip entails. The world famous wreck of the USS Liberty lies just off Tulamben Beach, a sleepy village in northern Bali that has some amazing diving. Great place for beginners to get lots of dives in. Price: $30 US a dive – $100 for unlimited dives during one day (5 is probably most you could do) as offered by Tulamben Wreck Divers. These are one of the original operators to set up in Tulamben – an Australian husband and wife team, Tony and Dot, who previously pioneered whale shark snorkelling trips in Western Australia – and have been offering the unlimited dives package for $100 since 2010! 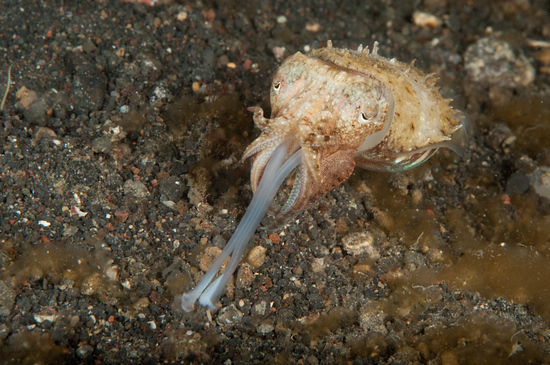 If you like seeing weird and wonderful underwater creatures, this is the place to come. Lembeh has an amazing array of marine life and is very affordable too. Price: NAD Lembeh resort offers $399 for 8 dives and four nights accommodation and all meals – so that works out as $50 a dive, but you need to factor in the accomm and meals as part of that – see NAD Lembeh’s rates page. See also my trip report on visiting NAD Lembeh resort and I went back again, and got some even better photos, diving Lembeh Strait in March 2011. A remote spot at the northern-western tip of Indonesia, Palau Weh is a superb location for doing lots of cheap dives on the huge house reef right in front of the resort, as well as taking a boat to explore further afield. Full details in the Palau Weh trip report. The Perhentians have long been a backpacker haven, two small islands with nothing but beach – no roads, no traffic. There’s some nice diving around the area too and a good variety of fish life. Price: 80 Malaysian Ringgit – around $21 a dive – see Turtle Bay Divers and look under the Price List link. 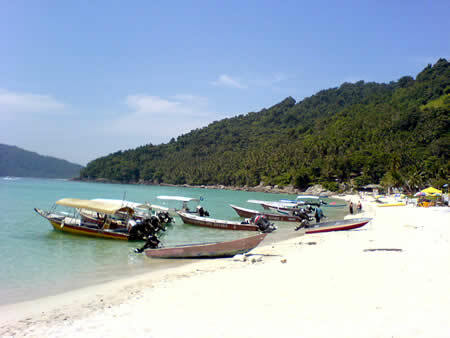 See also my Scuba Diving the Perhentian Islands: A Quick Guide and my Perhentian Islands article for Asian Diver. Despite having a huge coastline, Vietnam doesn’t get much dive attention. There are some interesting spots to explore but the main area is Nha Trang. Price: $40 for one dive in Nha Trang, $60 for 2 dives. You can read my Nha Trang report for more info. Sogod is a hidden gem in the Philippines, pristine reefs and annual visits by whale sharks. In Davao in the southern Philippines, it’s even cheaper – 1150 Pesos per dive – $26 US at WindAndWaveDavao.com. Davao is a little known macro heaven – I wrote a full article about Davao for Scuba Diver AustralAsia magazine a while ago. There are loads of other places in the Philippines to go diving from the beach (eg Anilao, Puerto Galera, MoalBoal, Apo Island etc) and they won’t be that much more expensive (or much cheaper) than these places. See my Best Scuba Diving In The Philippines page for a rundown of what’s great about each of these places. There are also several liveaboards in the Philippines which offer good value compared to resorts. That is a quick rundown of places I’ve been too that are cheap to dive – I know there are many more (for example, Tioman and Redang in Malaysia, Sihanoukville in Cambodia, etc). If you have suggestions of other cheap places to dive, please leave a comment and include a specific dive operator you recommend so I can check their prices. Thanks!